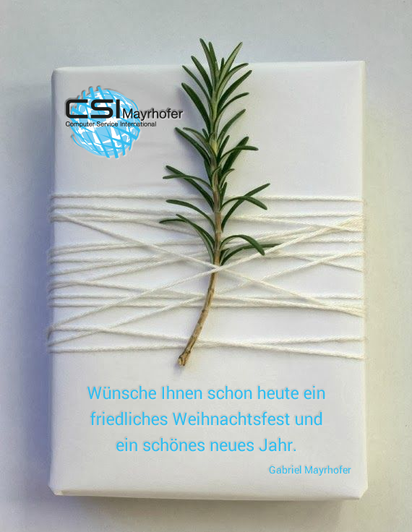 Weihnachtswünsche - CSI Mayrhofer "Kompetent, schnell, preiswert!" I am not sure where you're getting your info, but great topic. I needs to spend some time learning much more or understanding more. Thanks for great info I was looking for this information for my mission. Have you ever considered about including a little bit more than just your articles? I mean, what you say is important and all. However think about if you added some great photos or video clips to give your posts more, "pop"! Your content is excellent but with pics and videos, this website could undeniably be one of the most beneficial in its field. Terrific blog! Wow that was odd. I just wrote an extremely long comment but after I clicked submit my comment didn't show up. Grrrr... well I'm not writing all that over again. Anyhow, just wanted to say excellent blog! This piece of writing is really a nice one it assists new web users, who are wishing in favor of blogging. Hi there friends, pleasant paragraph and pleasant urging commented at this place, I am actually enjoying by these. Sie benötigen eine eigene Website und brauchen bei der Bearbeitung Hilfe, dann sind Sie bei mir genau richtig. Melden Sie sich einfach hier an und Ich helfe Ihnen bei der Erstellung Ihrer Wunsch Homepage.